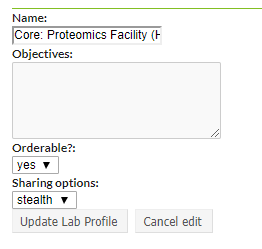 The Group Settings tab of a Lab/Group is used to define general lab information, define a primary contact and set invoice preferences. Orderable? : Used by iLab's requisitioning module. Sharing options: Used by iLab's requisitioning module. You may edit the primary contact for this group by clicking on "click to edit". If there is already a contact for this group and you wish to change it, hover over the name until the red pencil displays. Then, click the pencil to open the drop down box and select a different member. Indicate whether this group prefers to receive paper copies of invoices by checking the box, then click "Save preference". This setting can be used by PIs, Group Managers and Core Staff to filter invoices, but it has no other direct impact within the system (in other words, it is up to the core to review this preference and send a physical copy if desired).